Want to know what I’ve learned from writing three “successful” blogs and dozens of smaller efforts? Out of everything I’ve done to build my blogs, one stands out as the most powerful by far: email lists. Nothing is as potent as a large, targeted, responsive email list of engaged followers. But how do you build that list? If you’re like me, you probably spent years with a little “subscribe to my blog” form sitting quietly on your sidebar. And it probably converts .001% of your visitors. Once I saw the potential of email lists, I quickly realized I needed to build my list faster than that, so I spent years testing all the different possibilities. Big, scary goals become achievable when you break them into their composite parts. So, what is actually required to “grow a massive email list”? Growing your email list doesn’t require some lucky break or some magic potion. You just need to steadily improve these three levers. Here are six key techniques and tips to grow a large email list, that will help you see immediate growth. How many people see your homepage? I just pulled up Google Analytics for my blog, and it looks like my homepage is the third most popular page for this last month. That means my blog’s homepage gets as many visitors as my most popular posts! What have you done to optimize your homepage for new readers? 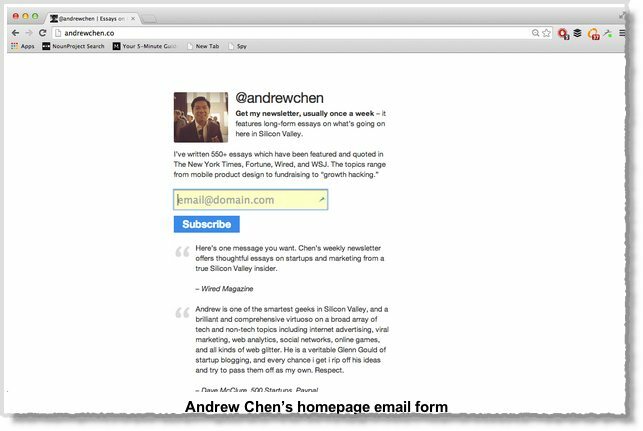 Andrew Chen, a Silicon Valley marketing genius, realized this opportunity years ago, and he transformed his blog homepage into a massive email form plus an introduction to his most valuable posts. Others have since tried the same technique, and there’s even a homepage email collect WordPress plugin that makes it easy to do it yourself. When I first started my latest blog, I spent the first couple months writing amazing content. With a great group of friends to help promote my content, I routinely drove 1-3k visitors to my new posts, but very few of those visitors actually joined my email list. That’s because the only way to join my email list was through a small form on my sidebar. Most visitors probably never even noticed it. 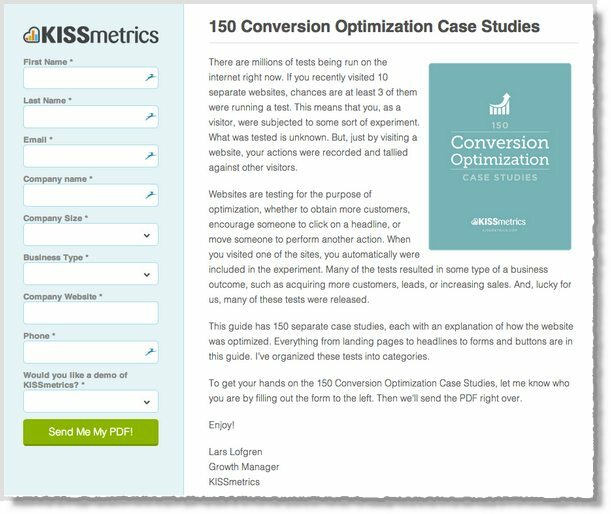 Since I knew I needed to build a large email list, I started testing out a few other tools to boost my conversion from visitor to subscriber. That’s when I discovered List Builder by SumoMe. Totally free. With very little setup, this free popover plugin now gives me a 4% to 5% conversion rate from visitor to subscriber! I simply installed the code snippet, edited the wording and coloring, and, wah lah, my email list started growing. This is what my popover looks like. Popovers work extraordinarily well because they grab your readers’ attention much better than a sidebar signup or even a homepage form. But the vast majority of blogs fail to meet this entry level requirement. So how can you write stunning content that over delivers in a fun package? Scientifically craft a snappy headline. Most successful posts are around 2,000 words. Simply put, write articles you would be excited to read. I love Tim Ferriss’ blog because it’s filled with uber practical posts like this. Depending on your personal preference, you can write short, snappy posts (like Seth Godin) or long, detailed essays (like Paul Graham). The writing process can be painful at times, but don’t sacrifice and publish a sloppy post. I remember one particular post that just wasn’t coming together. It was late on a Friday night, and I wanted to have it finished before the weekend. Growing more and more frustrated, I continued banging my head against the keyboard until I fell asleep under my desk at 3am. Ultimately that post became one of my most popular yet – but only after I rewrote everything I did that Friday night. If things aren’t coming together, give yourself the freedom to simply delete and restart. Think back over the dozens of subscription forms you’ve seen this week. Chances are, most of them said something like “Get our latest posts!”. Chances are also pretty good that you didn’t sign up. If you want your email list to stand out (hint: you do), take the time to create a massively valuable subscription incentive. The best news is, you don’t even have to spend a lot of time slaving over your giveaway! Simply take something you’ve already written and edit it as needed to transform it into something else! For instance, if you have a really long, detailed blog post, you can turn it into a valuable ebook by simply editing it into the right format and adding a bit more information. Bonus tip: Noah Kagan has recently found a lot of success by creating article-specific incentives. For instance, on a recent post about data mining, he gave away the exact spreadsheet using a LeadBox. Conversion rate testing is only for big companies selling expensive products, right? Actually, A/B testing can be a powerful yet simple tool to help you grow your email list much faster! Suddenly, that same batch of visitors gives you 70 subscribers – that’s 20 extra people who have joined your blog community! Does A/B testing require you to hold a PhD in statistics or be a real-life hacker? Not at all. WIth the testing platforms available today, you can easily run A/B tests without ever editing a line of code. Just use something like Optimizely (for general testing) or KingSumo (for headlines). Within your platform of choice, simply create a couple variations to try and create a goal (usually either a button click or a “thanks for subscribing” page load. Once the test finishes (make sure to achieve statistical significance! ), create a new variation and continue improving on each new design. So you’ve written amazing content, A/B tested your headlines, and designed massively valuable incentives. Dozens of new email subscribers eagerly run to join your list every day. Time to declare success and stop working so hard, right? Actually, the real work has just begun. Numbers on your newsletter statistics page are just that. You can’t build a vibrant community on a stack of dry email addresses. Each new subscriber is like a conference goer at a tradeshow booth. You’ve got their attention – now you need to keep it. Out of all the thousands of email lists I’ve joined, only one remains forever etched into my memory. Derek Sivers transformed me from an email subscriber to a true fan. Sometime in 2011 (I can’t find the original email), I subscribed to Derek Siver’s email list (the founder of CD Baby). I can’t remember whether his first email was a personal welcome email or an automated welcome email. Either way it was enough to get me to reply, and we exchanged a couple emails. Suddenly, I wasn’t just subscribed to a blog I enjoyed – I was following a person I respected. Three years later, I’m still excited to see his latest posts, and that personal touch has left me with an emotional connection to his blog. Whether you create an automated email flow packed with world-changing information or personally greet each new follower, find some way to make your emails essential. Your readers shouldn’t just read your emails, they should be excited to see your name in their inbox. This post is chock-full of tactics that will dramatically increase your email list, but with this many options, you’re at significant risk for a common ailment: analysis paralysis. Don’t worry about doing everything perfectly. Go do something (email one of your newest subscribers?) right now. Just start today, and you can do more tomorrow. Guest author: Nate Desmond works at SumoMe helping other bloggers see massive growth with free plugins like List Builder (the popover plugin from above) and Image Sharer.